You are so worried about your hair not growing yet there are some practices that are undermining your efforts. You comb it daily and that causes a lot of breakage. Use your fingers in styling. If the hair is short, use a wide tooth comb. You don't deep condition often which leads to dry, brittle natural hair. Try to deep condition at least once a month to provide moisture in your hair. Your hair needs moisture especially in this part of the world where the weather is mostly dry. Have a hair spritz to use during the day to ensure moisture retention. 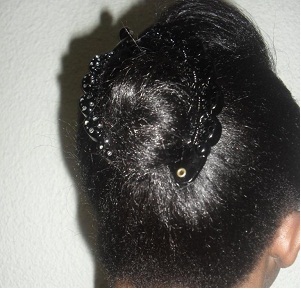 The hair products aren't working for you and you are reluctant to change them. These products may cause more damage so if it's not working, either swap with another person or give it out. You focus on growth and not retention and therefore don't know why you aren't getting the long hair you want. Pay attention to how you protect your hair and what you use in protecting it. Keep the ends from the shoulders to stop it from rubbing on the Coar of your dress. That can cause breakage. Not detangling properly can also cause breakage. Lastly, sleeping without covering the hair is a major cause of dry hair so protect your hair at bed time with a satin cap or bonnet. If you still experience breakage after doing all these, check your water. Hard water can cause build up of minerals so use a chelating shampoo to wash the hair at least once a month.